Eaton’s Duplex (or double basket) strainer can operate continuously and never has to be shut down for cleaning. This type of basket strainer has two separate strainer basket chambers that operate independently. When one basket chamber becomes full, the flow is switched to the other allowing the first basket to be pulled out and cleaned. A duplex or double basket strainer can operate continuously and never interrupt your process. Ideal for applications where pipelines cannot be shut down for basket changeout. 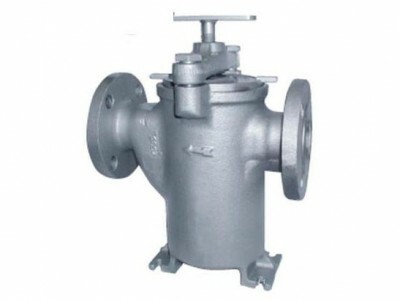 A Y-strainer has the advantage of being able to be installed in either a horizontal or vertical position. However, in both cases, the screening element or “leg” must be on the “downside” of the strainer body so the entrapped solids can be properly collected and held for disposal. Eaton heavy-duty Model 85 Y Strainers are furnished with high quality stainless steel screens that are carefully fabricated to fit the strainer body perfectly. This, coupled with the precision machined screen seat on the body of the strainer, protects against any bypass. Pipe Size A B C D Wt. lb. With more than 75 years of experience designing and manufacturing pipeline strainers, Eaton’s Custom Design Team can work with your engineers to create a unique basket strainer that will meet the requirements of any application. Eaton ensures that the finished product will be exactly as you designed and will perform to specification. The Model 2596 automatic self-cleaning strainer, designed for the continuous removal of entrained solids from liquids in pipeline systems, is available in sizes 2″ through 8″ in cast construction and 10″ through 60″ in fabricated construction. Design and construction are in general accordance with ASME Sec. VIII, Div. 1. A wide range of screen designs and perforation/mesh sizes are available, as well as custom designs and exotic materials.